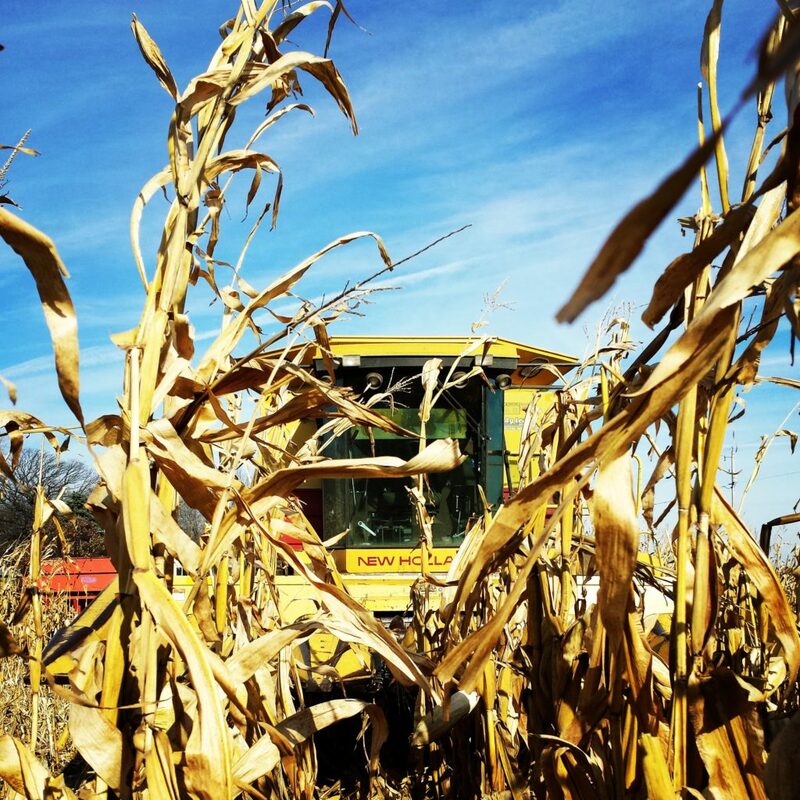 Did you know that there is more than one type of corn harvesting going on right now? On our farm we grow and harvest corn that will later be fed to our cows as a portion of their overall diet called High Moisture Corn or HMC. Unlike shell corn, which is harvested and stored in grain bins and needs to be dry to prevent it from spoiling, high moisture corn is fermented and stored in silos or other airtight storage options. These are grain bins. 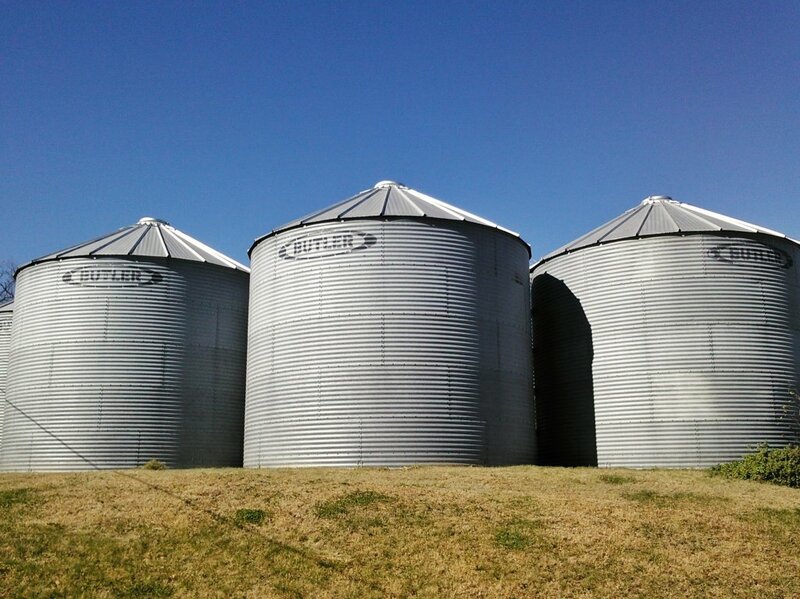 Unlike a silo, bins are used to store dry feeds like corn or soybeans. 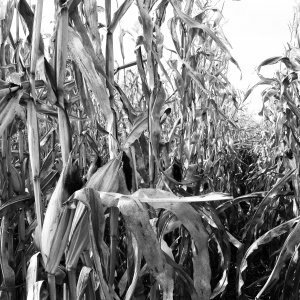 Shell corn is considered dry at 15.5% moisture. Shell corn is also used to feed animals as well as for fuel and many other uses. Thanks to my friend Nicole for sending me a photo of their grain bins. Click on this photo to visit her blog! Before harvest ever starts, there is a lot of prep work to do, we must get the silos ready to hold the corn. Before we can refill our silos we have to make sure the silo unloader is ready to be lifted to the top of the silo. 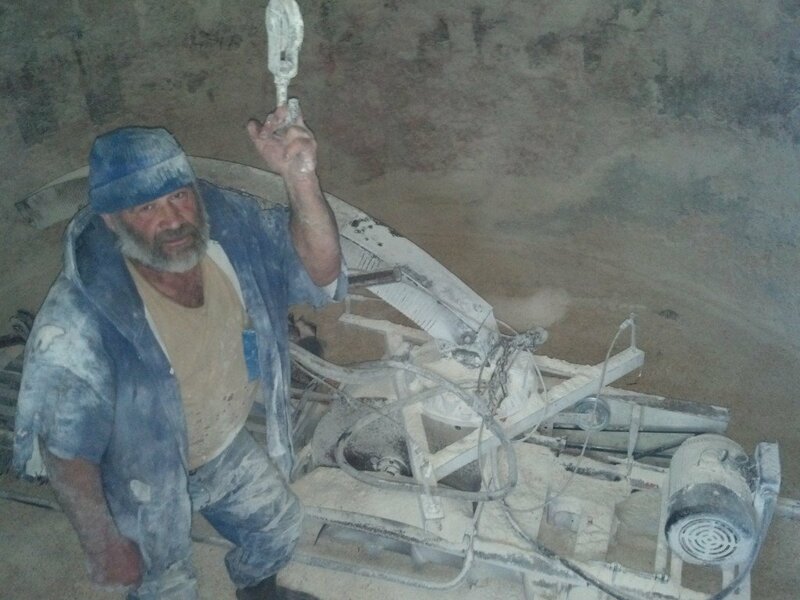 As you can see, a corn silo is a dusty place! 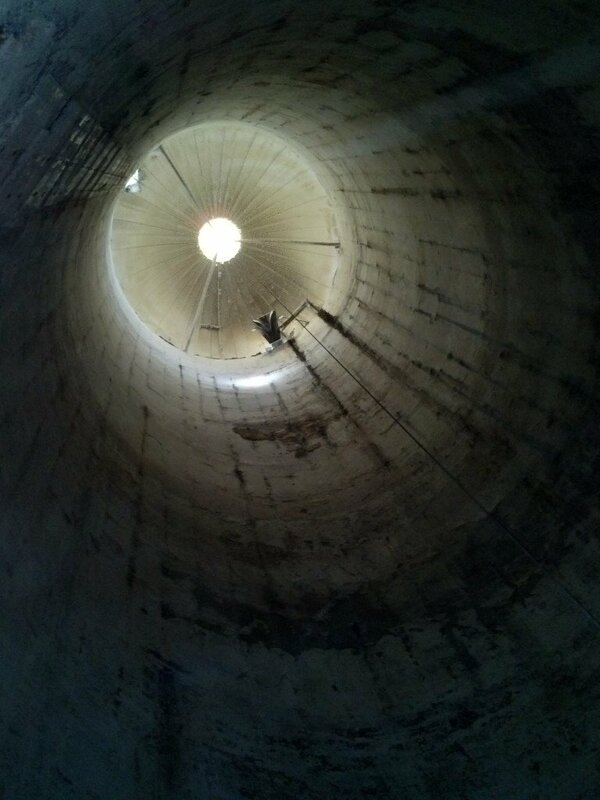 This is what the silo looks like from the bottom when it’s empty. The spot on the top of the silo isn’t actually open, it’s a window that lets light into the silo so it’s not pitch black when you’re trying to work in the silo. Once the silos are ready to go, we head to the fields and start harvesting our corn. Here is the quick and skinny on how it is harvested and stored. You may want to turn your volume down on the computer, it’s hard to get video of large equipment without large noise. This is high moisture corn. It looks like shell corn but it has (surprise!) a higher moisture content. If this was shell corn, Hubs wouldn’t be able to easily crush the kernels with his fingers. We don’t just randomly guess at how much moisture is in our corn, not only does the combine have a moisture sensor, we have a tester that reads the moisture content of our corn. Ideally high moisture corn will be 25-30% moisture. This field was 23.3% so slightly on the dry side but not too bad. To harvest the corn, we have our neighbor/Hub’s cousin come with his combine to harvest for us. It doesn’t make sense for our farm to own a combine that would only be used for about a week each year. The combine harvests the corn and then puts it into a bin that we can haul back to the farm. We usually have two people on tractors running bins of corn back and forth between the field and the farm so that the combine can keep rolling. We’re lucky that this ground gave us any corn this year after a very wet spring. Here is what the field in the video looked like earlier this summer. 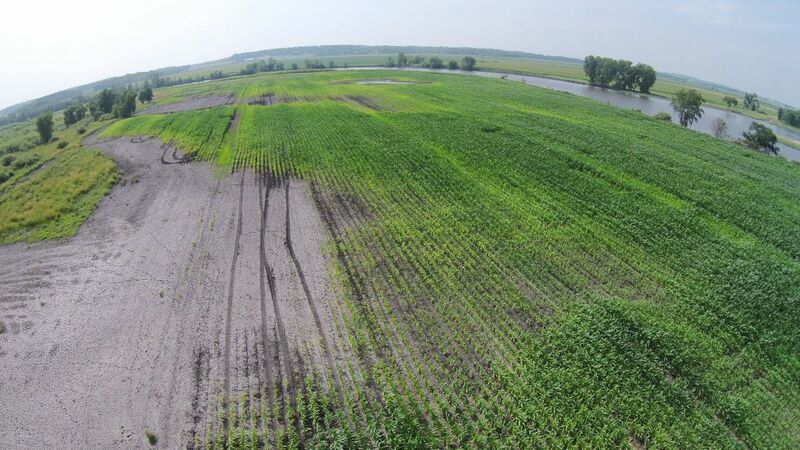 The bald spots are where the corn we planted drowned after too much rain this spring. You can see the Crawfish river in the background. After we haul the corn back to the farm we put it in the silos. 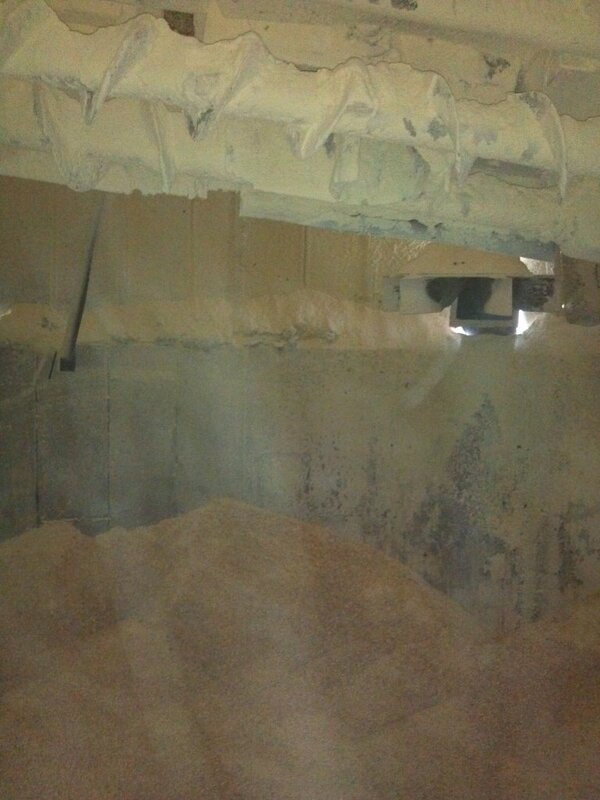 On our farm we add an additional step before this happens by running it through a hammer mill that crushes the kernels. This makes the corn easier for our cows to break down and utilize the energy when they eat it. Some farms use a hammer mill when they pull the corn out of the silo to feed it. 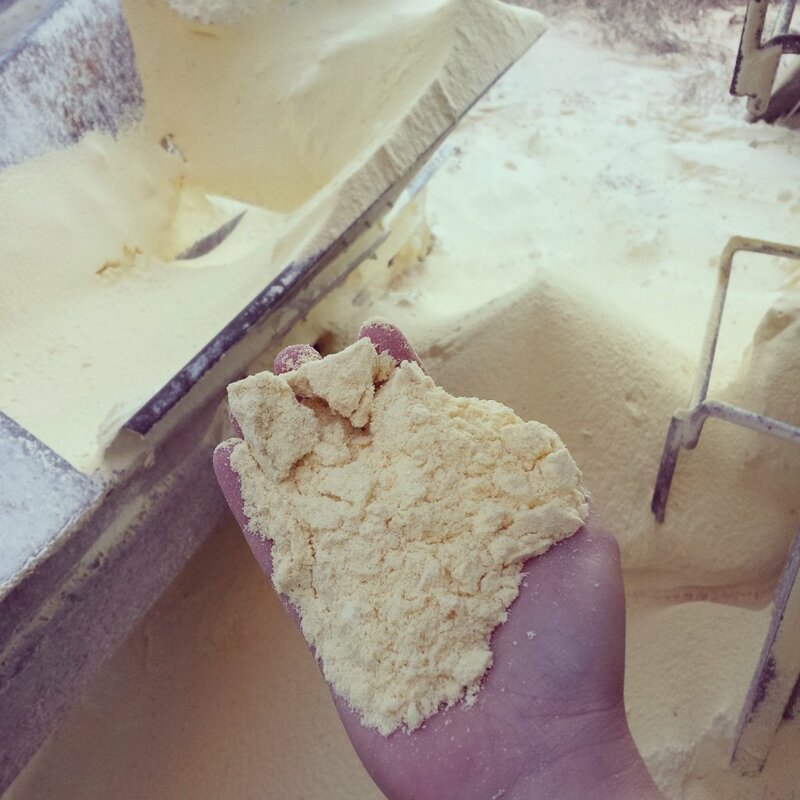 The funny thing about using something that pulverizes the corn before flinging it up the silo is that we end up with corn flour everywhere! 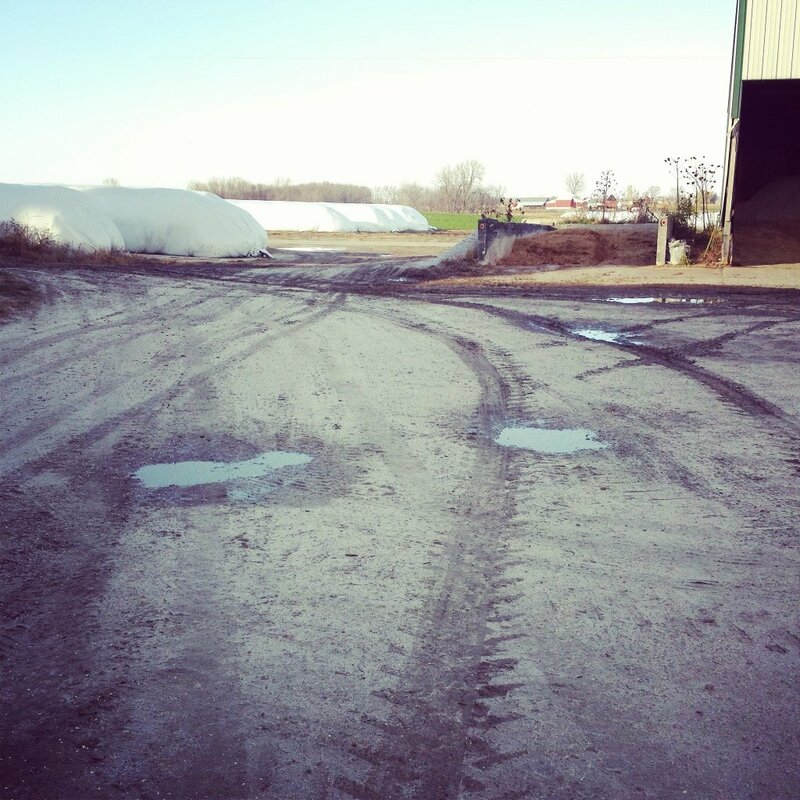 No that isn’t snow or frost, it’s corn dust! What goes up, must come down right? The little particles of flour that escape when the corn is crushed and sent up the silo collect at the bottom of the silo chute. Hubs remembers his mom making pancakes out of this flour. Of course I meant to grab a ziplock bag full but I forgot and then it rained. Corn flour paste probably doesn’t make very good pancakes. This last year we planted about 180 of our 300 acres with corn, most of that was harvested for corn silage which is the entire corn plant, not just the kernels. This year we harvested about 85 acres of that 180 acres for high moisture corn. The 85 acres gave us enough to last us about 15-16 months according to Hub’s math. We were going to include more exact calculations but I can’t math and trying to figure it out exactly was making us fight. This is (a bad photo of) the silo full of corn. This year we filled one silo full and another silo about half full. 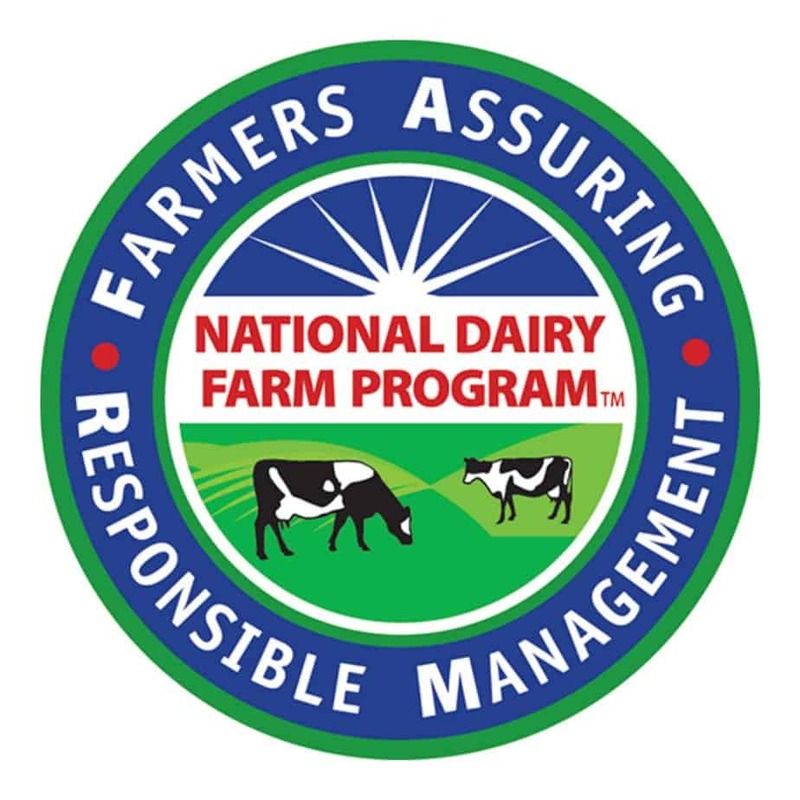 Now that our corn silage is done, our soybeans are harvested and taken to the coop in town and high moisture corn harvest is all done, we can feel the relief of knowing that we have enough feed for our cows for the next year. But the work is far from done. 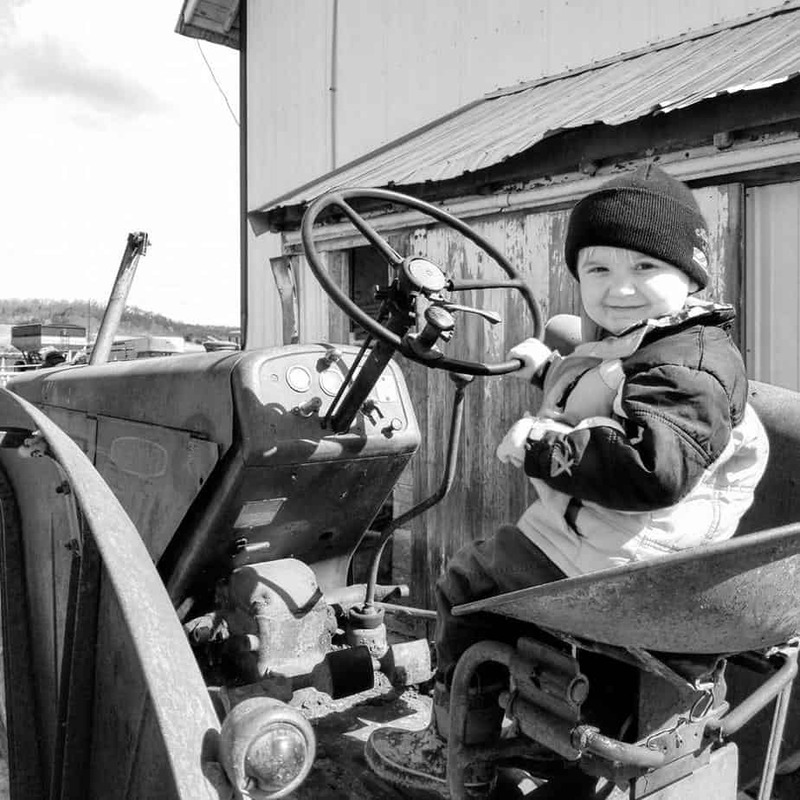 We still have fall tillage to do and lots of things to get ready on the farm before winter sets in. 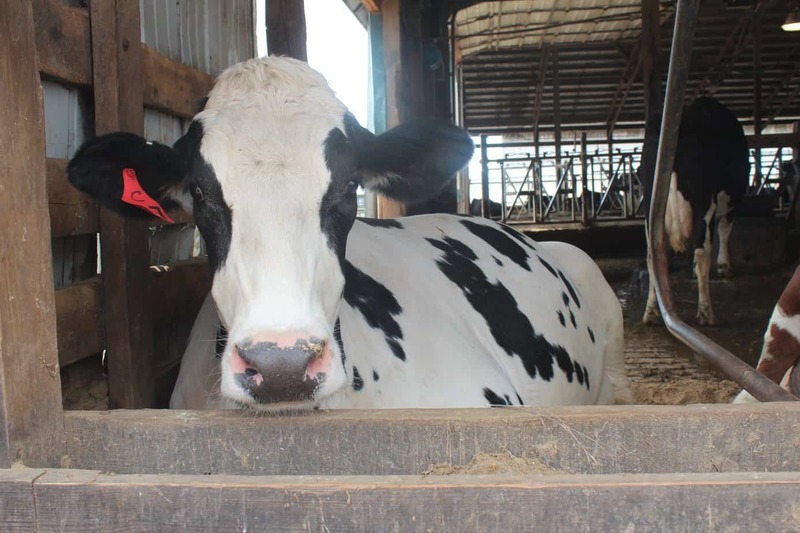 If you would like to know more about what dairy cows eat, click HERE. 8 Comments on What is High Moisture Corn? Thanks for a great post, Carrie! Are varieties for high moisture corn different than for shell corn? There are lots of different varieties of corn, some are better for one use than others. We plant corn that can be used as silage, HMC or shell corn so that we have flexibility to use what we have planted for the best benefit to our farm. On a perfect year we use the acres we plant as we intended them to be used but on a year where we don’t get enough rain or we have some other weather issue, we might need to take more for silage and buy corn. Thank you, Carrie. I didn’t know anything about high moisture corn before today. Great post! We live on a beef cattle ranch, and I didn’t realize that HMC could be pulverized before being put in the silo. I thought your pictures and explanations told a very complete “story”! I too never knew HMC was stored like that. My experience has been with Harvestore silos and running the HMC through a roller mill at feeding time, this method, and your explanation was interesting and educational. Thank you for sharing. I am from India, wanted to know if there is any data on protein and other nutrition values for HMC. Awesome post! 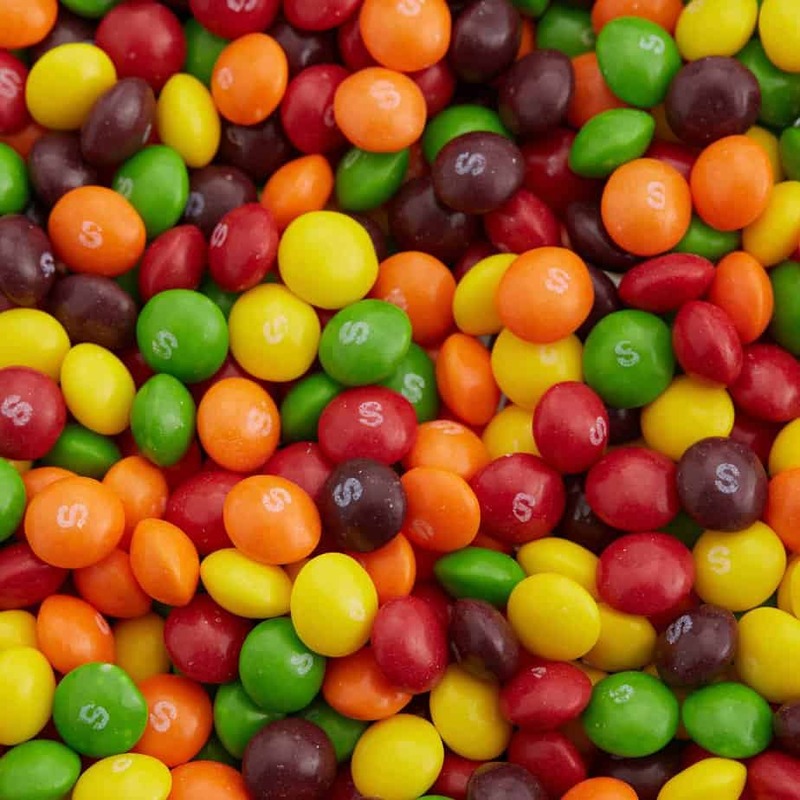 I really like HMC, it tastes tangy.